A wine aerator maximizes red wine's exposure to air and lets it breathe, releasing the wine's aromas and unveiling the flavors within. An aerator set makes the perfect gift for the red wine lover in your life. Aerator sets come in a range of prices making them an option for almost any budget. If you want to enhance the flavor of any red wine, an aerator set is a must. There are several types of red wine aerators on the market. From those priced under $20 to those around $70, there is an aerator to fit your needs. Many wine shops and specialty stores sell aerator sets as well as sites online. The following sets are among the most popular on the market. Priced at $69.95, this popular aerator set will enhance your favorite red wine. The set is designed to speed up aeration and allow wine to quickly breathe. The tower portion of this set holds the tool in place while aerating the wine, making the process hands free. It is simple to use and only requires you to hold the aerator over the glass you are using for wine, then pour the wine through the aerator and into the glass. This set includes the aerator, stand with tower, and sediment filter to trap any particles before they get into your glass of wine. 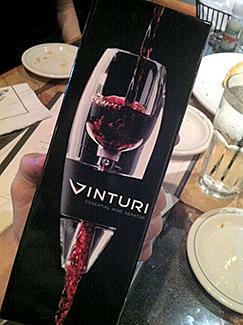 The Vinturi can be found at stores such as Williams Sonoma and Crate and Barrel. 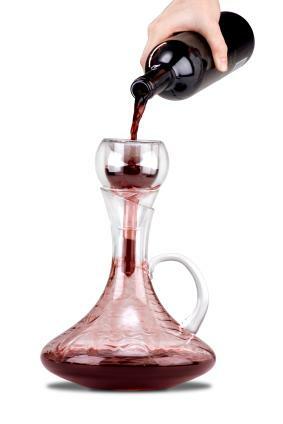 Wine Enthusiast features the Vivid Wine Decanter and Aerating Funnel Set for $59.99. This handmade set is done in a stylish European design with a wide base and lead free crystal wine decanter. The stand can be used for storage and is done in stainless steel. Also included is a removable screen to filter out any sediments in the wine. The Vinamor was featured on the television show Shark Tank and is a unique device, as well as a consumer favorite. It consists of a single glass aerator that sits on top of the wine glass and filters wine through a stainless steel filter. This aeration method softens tannins and catches any loose particles before they enter your glass. This aerator is easy to use and can be conveniently switched from glass to glass. It is priced at $39.95. The Trudeau Aerator comes with a stand and provides two times the aeration. It allows wine to be aerated while inside the bottle and then during pouring. This set makes decanting wine by the glass simple and clean. This set is priced at $24.99. Wines that contain more tannins will require more aeration than lighter body varieties. Aerators can be used for both red and white wines. Use an aerator with a filter so that no sediment is transferred to your wine glass. Always follow manufacturer instructions for your specific aerator and wash it after each use. Some aerators are dishwasher safe, while others must be washed by hand.